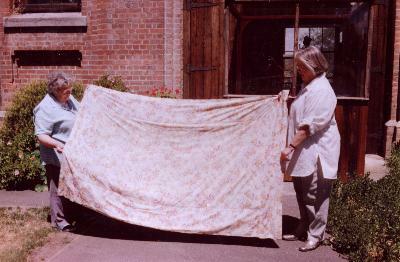 Wholecloth quilt with both sides of floral cotton. The padding is thought to be hessian bags. The domestic Wagga was made by Mrs Amy Howard and at some later date was donated to the West Tamar Historical Committee in Beaconsfield Tasmania and is displayed in the Grubb Shaft Museum. It is thought to have been made during the last depression. Wholecloth quilt of white cotton with hand appliqued flowers in 3 shades of red. The centre of the quilt has 6 separate flowers radiating from a circle and each corner has a separate arrangement of flowers. The white cotton quilting is in diagonal lines and a daisy pattern. There is a narrow red border widely scalloped. The backing is white cotton. There is no padding. The padding consists of layers of pieced used clothing including; part of machine knitted child's wool dress (Nancy had this when she was 3 or 4); part of father's cardigan; parts of 'neck to knee' bathers in light green and dark green wool. The padding is all hand pieced and machined around the edge. There have been 2 wholecloth cotton covers to this quilt. It is one of a pair. Wholecloth quilt made of deep cherry red satin with backing of sky blue satin. The padding is cotton wadding. It is hand quilted and the pattern is an all over one of four leafed clovers with a border of crescent shapes within straight parallel lines.